This entry was posted in all about me, aspirations, domesticality, food, save me from myself, vacation. Bookmark the permalink. When you’re as excited about life as you are, it’s hard not to overschedule. I await your return, sweetheart. Sure, pick up a baby or two for me while your down there. That would be peachy! Seriously, simplifying your life is not easy. It’s HARD to cut back to a pace that is reasonable for you and your family. I have to fight over-committing constantly. I’m a first-time reader and I just wanted to say that I’m glad your neighbor told you about her concerns. It’s no fun always being on the go. I hope this is something you’re able to accomplish. Your blog sounds great and like one I want to continue reading. Thanks. I’ve been feeling that same pain lately. Don’t know how many times I’ve muttered to Hubs recently, “something’s GOT to give!” Sounds like you’re on the right track. Don’t mess with YOU… I know I don’t want to be smashed into peach pulp. Ahhh, the overscheduling. It’s what I do best. I am trying to learn how to say no. It’s really a very simple word. It’s often one that children learn early on in their language development but somehow by the time we are grown we forget how to say it. When I joined the church, I was immediately overwhelmed by all the canning, children raising, bread baking, food storaging, quilting, sewing and the other millions of things that it seemed that all “good Mormon mothers” knew how to do. I have realized somewhat over the last 5 years since that I just can’t do it all (and still have hair left) I pick the things that are most important and go from there. I’m glad you took the day off to rejuvinate. Cutting down and saying no is probably the hardest thing that mom’s need to learn to do – especially as your kids get older. Our kids aren’t in a sport every season, and they don’t have a different class that they run to for a different night. We’re learning to enjoy this us time while we have it. I do not can. For the very reasons you mentioned. All I remember of canning as a child was watching my poor father and mother in August in a 120-degree-covered-in-grapes kitchen at 1am trying desperately to finish in time to collapse in bed and get to a church meeting at 7 the next morning. No thank you, no canning, no canning, no thank you. 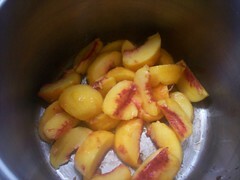 Costco peaches work fine for me. Grapes from Chile in December from the grocery store work fine for me. My father thinks I’ve failed Pioneer 101, but that’s okay. I would have been a whiny, complainy frizzy-hair-because-they-hadn’t-invented-hair-gel-yet pioneer anyway. We have cut WAY back on extra activities. I teach my kids piano myself — the mom-kid-parent-student dynamic doesn’t always run perfectly, but it saves driving to ONE MORE THING. My older daughter does karate. My son is adjusting to a new 5 day/week pre-K class — that’s all he needs right now. I have been bugging my middle daughter to pick a sport, so she can be active and make friends. Then I realized — she is active, she has friends and she doesn’t want to be driven to a “sport”. Life is her sport. So we go on a family bike ride a couple times a week and that is her “sport”. You linked to me. I feel like a celebrit just thanked me in their Academy Award speech. Wow. But yes, I totally understand and agree–at one point this summer I looked at our calendar and realized we had every weekend day and night booked for the next 6 weekends in a row. And they were all “fun” things, but there were so many of them we couldn’t enjoy any one thing. And hubby and I were working full-time, so the weeks were packed too. Its no way to live–because you aren’t really living, at that point you are just hoping to survive. And again, thanks for linking to me!!! This post spoke to me on 100 different levels. I keep telling D. that I can’t seem to carve out enough time for what I need to do…but maybe that’s because I’m spending too much time doing the stuff that, in the end, doesn’t have to be done at all. Have fun in beautiful Idaho. Oh Kathryn! I’m sorry the bread didn’t turn out. YOU SHOULDA CALLED ME!!! I could’ve helped with the canning too. I used to do that canning thing, back when there was only one kid/hellion to sabotage the works (please take me literally, here) and I had some kind of new mom energy to do stuff like that. I went around the neighborhood and asked fruit-tree owners if I could have their fruit. They all said yes, since they had all tried to can stuff in their more agressively home-makey pasts, but had kicked the habit when Costco was invented. 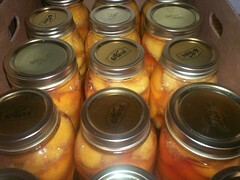 Anyway, I ended up canning peaches, pears, apples, applesauce, apple syrup (yum!) tomatoes, plums (yuck!) 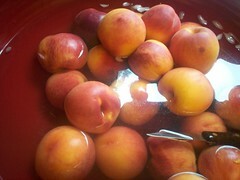 and plum syrup(???). Then I moved on to dehydrating. That’s tons of fun too. Actually, I want to call you. Do you have your cell phone? I would like to order a baby please! I have been getting baby hungry myself lately. I enjoy making my own bread…but I don’t do it all the time. Its more of a treat. I get to feel all domestic that day, and we get something really tasty but still good for us. Good for you for taking a step back and spending a day relaxing. I thought canning was a great adventure! I don’t want to be trendy or anything, but when and if I get my farm I don’t want to be wasteful! I would much rather can once a year than bake bread everyweek to be honest. But I get so PUPPY LOVIN’ mad every time I see canned peaches at the store!!! Your neighbor’s words spoke volumes to me. The real key is do any of us really actually slow down? It seems every year goes faster and faster even if I back fown my commitments. Do you think it went this fast for our parents when we were our kids ages? I’ve been praying about the answer to time management myself. I think I’ve found it, if I can just be obedient. I posted about it under “Time Management 101”. Hope you’ll stop by & enjoy it. Umm…wait…what were we talking about? This was exhaustingly funny, thanks for the laughs. Hello there! 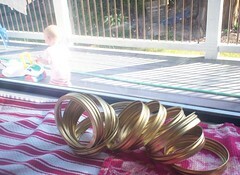 I am visiting from Boo Mama’s blog and posted about something similar this week. Overscheduling is a big problem of mine, and I always think I’m picking activities that are good…it’s just that they’re not always BEST. There’s a big difference! Thanks for your thoughtful post. I really enjoyed my visit! Enjoy your getaway! I am impressed that you can even think about babies after experiencing the birth of the Great Magoo. After Seth, all thoughts of a third child went bye-bye for me. 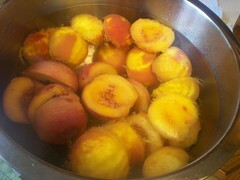 Try freezing your peaches next time. It’s WAY easier! 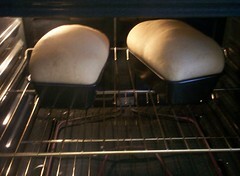 I think it’s great that you are able to do things like make your own bread for your family. However, many people who wish they could provide similar wholesome food experiences to their family simply don’t have the time. I hope you make your own bread simply to provide that food to your family, and not to feel better about yourself in the eyes of others. Bragging about it may only make those who just don’t have the time to do such a thing since both parents/spouses are working feel guilty when they are doing the best they can, which is buying the healthiest already made bread option in the grocery store. Can I just say, that yes, you are crazy busy, and yet you inspire me. I really want to make my own bread. And you did look ultimate darling. I have the before and after pics to prove it! My life is that busy sometimes, but not because I try for it! I love homemade bread, but not enough to even dream about grinding my own wheat, and not enough to make my day stressful making it. I don’t use the kitchen aid, though, I think it is 100 times better hand kneaded! I don’t know why, but I can taste the difference. I’m not sure that it doing too much, but rather having unrealistic expectations about the things that you are doing. I used to have a friend like that…she was always running, but really thought that she could meet her Dad for lunch in one part of the state, run to the opposite end to babysit for someone else, and then meet someone for dinner back where she started. She could have managed ONE of those things, not two, and certainly not all three, but she never understood that. I like to can, but it can only happen when I have help at home and NOTHING else to do that evening or the next morning. It’s a JOB! 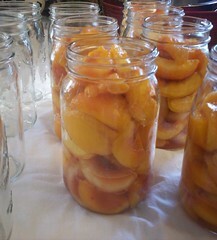 You will be so grateful come January when you crack open a can of sweet juicy peaches that you made. Mmmm. It makes really delicious, moist whole wheat bread and would be super easy with a Kitchen Aid to do the kneading for you (something I don’t have, sigh). Totally classic post. Love it. 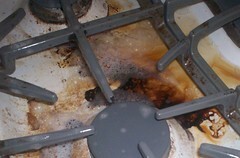 And taking one look at your stove top and hearing about the sticky floors reminds me why I didn’t make jam this year. Although . . .I bet it would go well with your bread. I learned this lesson last spring while making VBS decorations. My house was a wreck, but the church looked magical – for one week. I looked around and realized I was putting all my efforts into GOOD and FUN things that would not last and I made a commitment to start fresh August 1st putting my effort into my home and family first. I have already reaped incredible benefits and I’m learning daily the rich rewards of slowing down and being fully available to my family. I’m still tempted daily by other good and fun things (school scrapbook!! church garage sale!! women’s tea!!) – but each time I say no I grow a little stronger. Have you told your neighbor how many families she has richly blessed by her comment? Bless her! Making bread should be easy. After all we live in the 21st century. 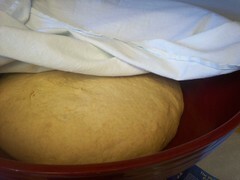 If I make bread I first plug in the bread maker, put the box of bread mix close the lid push the button. By doing this I can then push the button on the robot vacume cleaner so the floor gets cleaned. 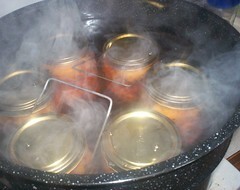 The only thing I know about canning is to accept canned stuff when it’s offered, but never try it at home. From Walmart I need everything for my soon to be born baby. Never forget to stop and smell the flowers. That is a great lesson to learn. Unfortunately for me (and for you if it’s genetic) it’s a lesson I have had to learn over and over again in my life. I think I’ve got it down and then something else comes up that “seems like a good idea at the time”. Will I ever finish that degree? Those 7 quilts I’m working on? The 20 years of scrapbooking? Your guess is as good as mine. I’m just trying to take it one day at a time. Now if you had just consulted with your husband before you planned all that, I’m sure he could have knocked some sense into you. I’m working on that consulting part because I am in need of sense in a bad way. I so so wanted to do the homemade bread thing. Even requested the bread machine as a wedding gift from my mom’s family in place of the traditional Kitchen Aid. We used it a bunch, but now just once in a while. In case bread baking is something that you would like to get off of your to-do list, or maybe move it to the occasional column, I found I good bread that is made with whole wheat and has no corn syrup or it’s evil cousin, high fructose corn syrup. And if you are lucky like us and have a Trader Joe’s to shop at you can get it for around $2 instead of $4. It is Milton’s Whole Grain Plus (the red label Milton’s). I found a picture of it on their website if you want to see it. All the other versions of Milton’s that I’ve found in our stores either use enriched flour or and the corn syrup. That’s “or ADD the corn syrup.” Sheesh.